Bonjour Singapore: Fashion blog with a focus on Asia: Adam Lambert rocks Singapore's Depression shoes at the VMAs! Surprising and exciting as it is to see A-listers sporting Singaporean labels, I can't help but see him as exactly the kind of guy who would want to wear Depression. His style is as daring, edgy and fashion-forward as the label itself. So onto the shoes. 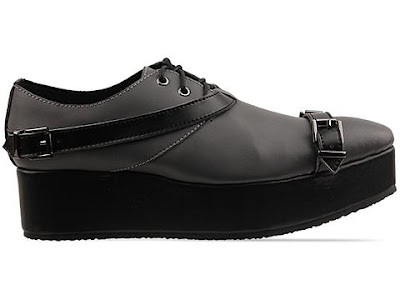 The platforms which Adam wore are better known as the Transformer Creepers - have the label's signature flat platform - perfect for guys looking for a little boost a la Tom Cruise style ;-) If you like them, you can still buy them online or at Depression's Cineleisure flagship store (if there are any left in stock, as it is from their previous Plastic Surgery collection). But seriously, it seems like Depression is fast becoming a cult label for visiting celebrities to take home. Let's not forget that Taboo of The Black Eyed Peas is also a fan of brand and has been spotted in their store in Orchard on more than one occasion. has been spotted shopping in their shop on a few occasions. As a friend and long time supporter of the label (my husband and brother in law have all been gifted Depression clothes courtesy of me) it makes me so so happy to see them hitting new heights of fame. I first wrote about them shortly after arriving in Singapore back in 2011 after I was blown away by their creativity and edge. It really couldn't have happened to two nicer guys than Andrew and Kenny, who gave up the corporate world to chase their dream. Lets hope it leads to some well deserved exposure and them taking Depression to the next level AND acting as an inspiration for all the fledgling labels out there in Singapore. So who's going to be the next celeb to get spotted in Depression you think? Take a guess! Depression flagship store is located on #03-05A, Cineleisure Orchard, Singapore. Follow them on facebook for more updates and latest news. these studded Louboutin boots the weeks before he wore Depression!